Haven't we been here before? If I remember correctly, I excitedly mused last Monday about experiencing my last day in this house....I was wrong - so very wrong! Here we sit, still here. But just like last Monday, we are supposed to fund today and thereby close tomorrow...so could it be that TODAY is my last day in this house? Please please please? "The day getting you down? Do you need a lift of body, soul and mind? Try new Trader Joe's Black Mango Tea. Guaranteed to turn even the grayest day a delightful shade of delicious!" Heehee, ok - I'll stop now. I know you are all out there shaking your heads and thinking she has gone a little loopy. But hey, loopy is good! What better way to maintain sanity then to purposely give a little up to the cause and accept the loopy in it's place? Ah, another drink. Simply lovely! Taylor made a flower! See it? See? See? She was so proud, she made it all by herself with no help at all. 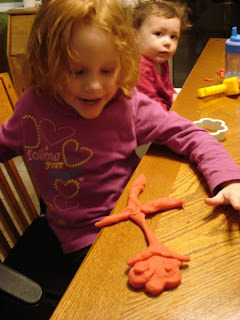 We were very proud of her too, and since we can't keep play-dough, the picture is helping us remember her first real great work of modeled art. And guess what else she made? Can you see it? I know it is hard with the picture made little-er. 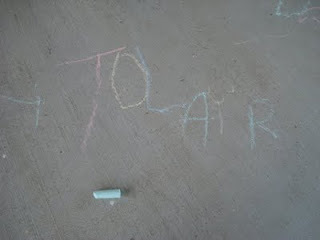 You have to look close - she did all but the 'R' all by herself, she needed a little help on the R, so I made it lightly and she traced it. Funny how when it comes to our kids, even a chalk drawing can bring a tear to our eyes and make us want to show it to everyone we meet. She got all the letters 100% right, just got them out of order. We are working harder on it now and I bet she will be writing it perfectly before long. I was very proud. I have learned from my kids this week that Taylor considered underwear an appropriate conversation for the dunner table. Twice in the last few days it has been brought up while we are eating with extended family. I will spare you the details, but let us just say it produced much laughter from the adults present. Of course, I need to make sure and write these down before I forget them so I can bring them up in front of her boyfriend when she is 16. Gotta have that! Ayla is saying more words together now. I love the birth of language stage. It makes me feel so un-worthy as a parent. This little one that came from me is all of a sudden speaking, being understood and becoming a real person. That feels so beyond anything I am capable of nurturing! Luckily it is one of those God nurtured gifts that I get to just do my job the same as always, and watch Him create this masterpiece of a person. One of the many blessings of parenting, watching the God nurtured abilities like walking, talking and growing. Her attention span is also getting bigger. This morning we spent about 45 minutes before Taylor woke up and we read 13 books together. Yes, I counted the pile afterward. And that is just one 45 minute span today - there will be many more! Every time we would finish one, she would go get another and sit back down next to me in the exact same place and pull the blanket up over us. It was nice, I don't always feel I get enough one on one time with her and the quiet of the morning with a fire in the fireplace is just so cozy and lovely. These are the memories I relish. We are trying to save right now to get the girls bunk-beds for Christmas. I have bought all the stocking stuff and the little gifts (got most of them in July/August when Target toys went 75% off) But Ayla needs a big girl bed - and it would be nice to have real beds to put them in. Not just a mattress on the floor which is what Taylor's is now. The bunk beds come apart so we can wait until they are a little bigger before we actually put them together - esp. with my dare devil of a 1 year old. She would waste no time at all climbing to the top and jumping down - and would probably attempt it in the middle of the night if she knew her sister was up there and she wanted to play. I hope we can manage it. And then we could get rid of the crib altogether! Always good to get rid of a piece of furniture we no longer need. We will trash it, with all the recalls of adjustable side cribs I doubt a thrift-store would even take it. Many memories with that crib, but so exciting to move on to the next stage. Ok - so my list for the day....oh! oh! Just got an email saying they are set to fund the loan today...hasn't actually happened yet but they are planning it! And if they fund it today we will get our keys tomorrow. Oh thank you God! This is good news, will update when it is funded for 100% sure. Yay! A walk is in order next. Need to get rid of this nervous energy. Taylor gets a story everyday on our walk. Today I believe it will be about a little boy who cries wolf. We have been dealing with this subject lately. Funny how her stories everyday always involve kids learning lessons related to things we are dealing with at home. How long do you think it will take her to figure it out? Ah well, at the moment she LOVES her walk stories and several times they have really helped with the behavior (like the little girl who wouldn't pick up her toys and so they all went into time-out until she proved to her mom she could be responsible and keep them clean) So for now the stories stay. I love you all - will keep you all up-dated via facebook. Many blessings on you and your homes today. And may you have a week filled with much adventure and even more chocolate. Hey! I don't know if you remember me, Laura's sister. I love the way you write and your patient, loving perspective of parenting. It helps stay focused on the sweet aspects instead of the frustrating! I'm usually just a lurker, but I had to speak out when you mentioned TJ's mango tea. It's the best! I was searching for a mango tea and found online that TJ's carries it. Since we don't have any TJ's here (it's awful!! ), my mom brings me out three boxes every month when she comes to visit. It's the best! I'll have to try it hot with milk and sugar, how you said you like it; I usually brew a pitcher of it and then drink it iced. Delish! Hope you're enjoying your new home and praying you get unpacked quickly with your little helpers!